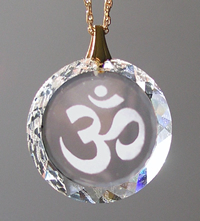 This 20 mm Swarovski crystal pendant features an OM symbol etched in clear crystal. Its shimmering edges are faceted. The pendant hangs on a 20" gold-filled chain that just reaches to the heart area.